The Rotorua Trails Trust will work to enhance the value of existing trails by linking them together and improving them, for multi-use where possible. This includes better links with trails in the surrounding districts and with national networks. We will work with iwi and other landowners, Rotorua Lakes Council, Bay of Plenty Regional Council, Department of Conservation, other government agencies, and recreational and environmental groups. The Trust will be an advocate for new and better trails and new uses of trails. We will develop and manage trails and will seek funding, sponsorships and contracts to do so. 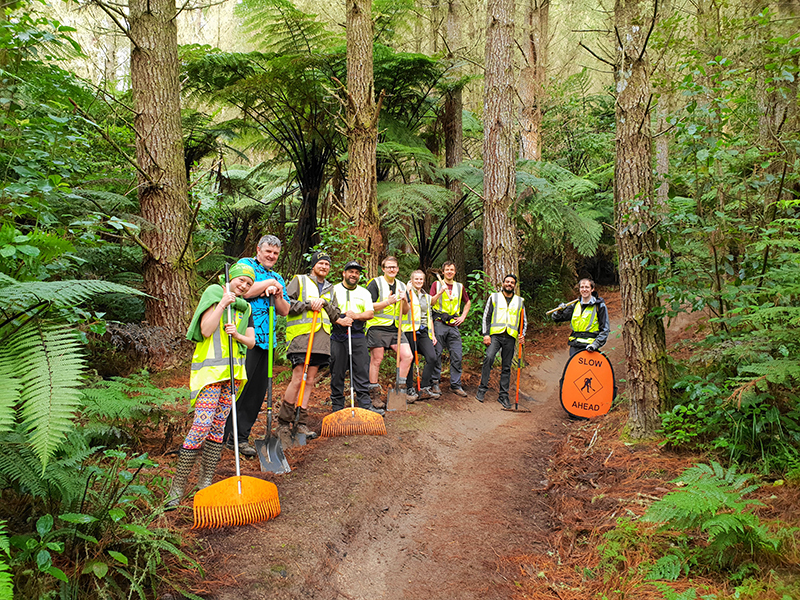 The Trust members are all volunteers and are continuing the work - and achievements - of the Rotorua Mountain Bike Club and trail builders over the last quarter century. The Club has already developed such a superb range and quality of trails in the Whakarewarewa forest as to make Rotorua the world’s best all-year-round mountain biking centre. The Trust has accepted the challenge of extending these trails and improving the network. Trust members are Grant Utteridge (chairman), Darren Ashmore, Gregg Brown, Catriona Gordon, Mike Gray, Mat Hunt, Toby Stovold. Recently, the trust hired a few lucky folks to help manage the trails. The newbies are Damian Clarke, who is the Trails Manager, Casey King, a trail builder and maintenance, and Kris O’Driscoll is doing communications and administration. We of course, still have our trusty contractors, Ash Edwards and Mark Thompson, too. The adoptees are an integral part of the trails. People have adopted specific trails and commit to maintaining it. Many of the adoptees spend hours in the forest digging, tidying and riding/running their trails. The trails would not be what they are without the amazing community of volunteers. Many people, locals and visitors, come along for working bees and trail work. If you would like to participate in these working bees, watch our Facebook event page.